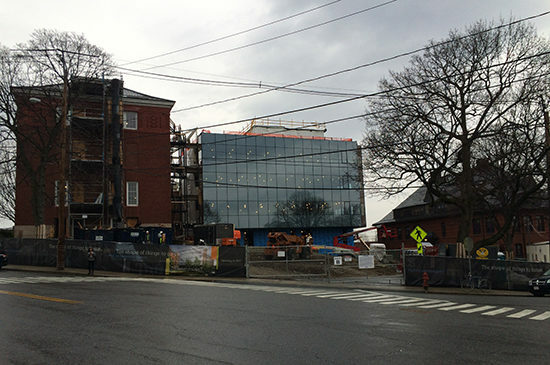 The Tufts University Science and Engineering Complex began construction in the summer of 2015. Now 9 months into construction we see a return of the old while bringing in the new. 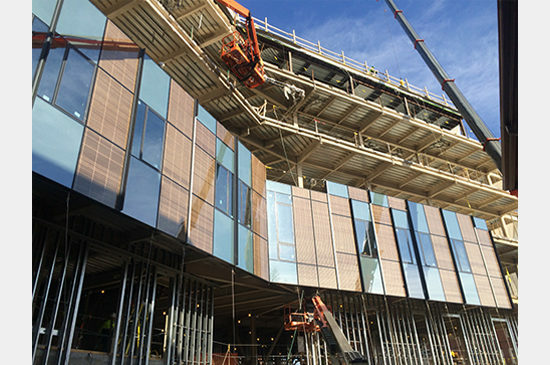 The new addition’s building structure is complete and the façade is taking shape, while the existing buildings have been gutted to show their original character. The new addition is primarily a curtainwall façade that shows deference to the existing context while bringing warmth and texture to an intimate courtyard on the south. 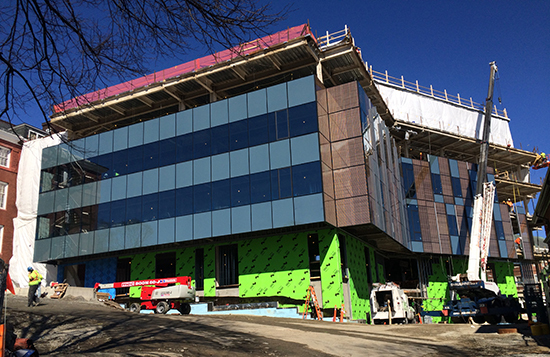 The façade strategy reflects the building programming with simple and crisp east and west façades that highlight the laboratories and the dynamic shifting OAKWOOD glazing on the south defining the office area. 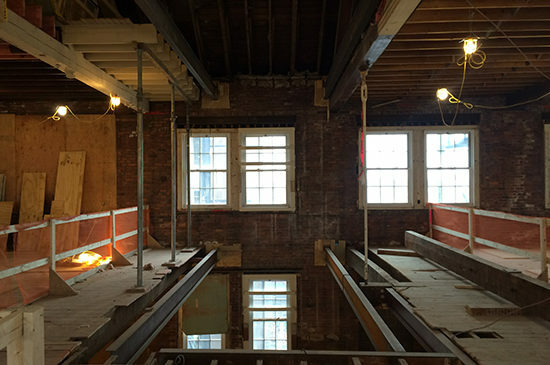 The existing buildings of Robinson and Anderson Hall are being renovated to show their unique structural systems. 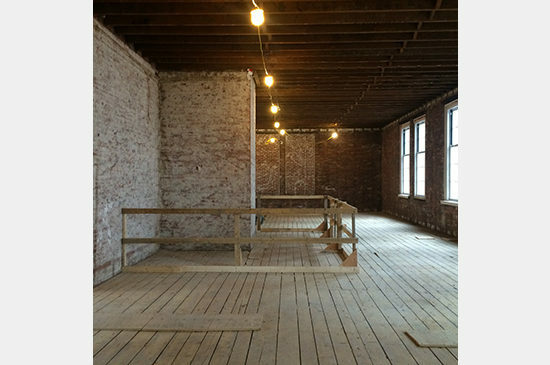 Robinson’s load bearing brick walls are being exposed, cleaned and patched. A new code compliant stairway is being cut into the existing structure and renovations to the existing auditorium have begun. 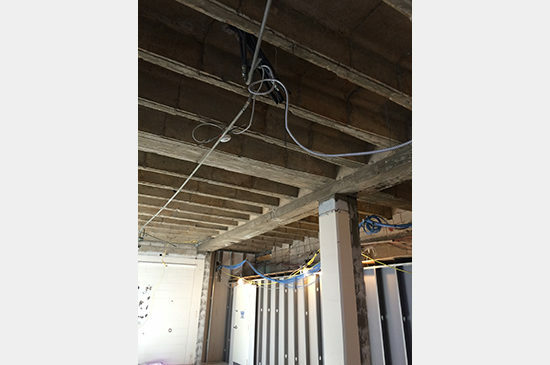 Anderson’s concrete slab and joists are being exposed and new utilities will soon be installed. In the coming months the ironspot brick base to the addition as well as the skylight for the atrium between Robinson and Anderson will be constructed. These components of the complex are the final pieces that bring definition and connection to the interior exterior relationships of public spaces around the site.